To be able to operate as a versatile wedding planner, a wedding professional, service provider or an events specialist nowadays, it’s imperative that you are familiar with wedding traditions and customs of different cultures and nationalities, so you are able to close the deal, meet or exceed your clients’ expectations and expand your business. Whether you are based in a multi cultural city such as Dubai or meeting international clients at home or abroad, you are bound to deal with clients of different cultures, nationalities and ethnicities. WEDDING BONANZA will help you understand the differences and similarities of multi cultural weddings, and offer you a great opportunity to learn the best practices, as well as, the dos and don'ts of planning a wide variety of weddings, be it Arab weddings, Indian weddings, Turkish, Iranian, European or African weddings. Through a carefully selected mix of presentations, case studies and panel discussions, you will get a chance to hear from expert wedding planners and professionals in the industry and network with like-minded people on that day. Click here to check who the speakers are. Kindly fill in this Registration Form. 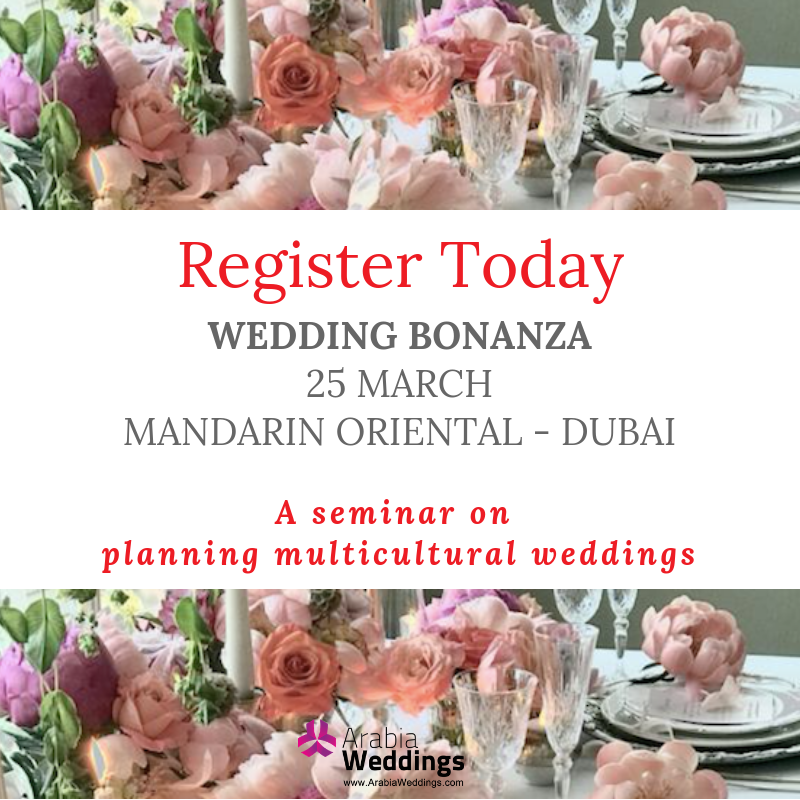 WEDDING BONANZA is a Seminar organized by Arabia Weddings, the leading online wedding planning portal in the Middle East and North Africa. Through its online and offline activities and events, Arabia Weddings fosters collaboration among the different stakeholders of the weddings industry to strengthen the sector and promote the region as a destination for multicultural weddings from around the world. Details of this Seminar on Planning Multicultural Weddings can be found here.